Originally from Normal, IL, saxophonist-composer Adam Larson, endorsed artist for P. Mauriat saxophone, Rico Reeds and Bari mouthpieces, began playing saxophone at the age of 11. 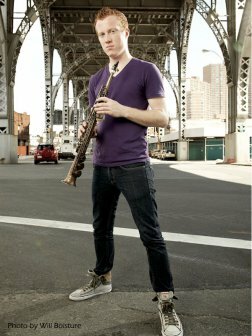 Described by critic Howard Reich of The Chicago-Tribune as “a player for whom the word ‘prodigious’ was coined”, and by Peter Hum of the Ottawa Citizen as “a saxophonist who brings Donny McCaslin and Mark Turner to mind”, Larson has garnered numerous awards that showcase his abilities as a performer and composer. Upon completion of his Bachelors degree at The Manhattan School of Music in May of 2008, Larson was selected as a member of the inaugural Manhattan School of Music Jazz Institute, to continue his studies as a Master’s student. As the leader of his own quintet, Larson recently recorded his debut album “Simple Beauty”, which is set for release January 16, 2013. Larson keeps an active schedule with his quintet having performed at several New York City venues including The Jazz Gallery, The Blue Note, Smalls, Cornelia St. Café, The Kitano, JALC, and several others. In addition to his work as a leader, Adam can be seen as a sideman with several groups such as the Michael Rodriguez Quintet and the Nils Weinhold Quintet. Larson has had the privilege to record on many records including Nils Weinhold’s Shapes, drummer Bastian Weinhold’s River Styx, and trombonist Marcus Lewis’ Facing East, to name a few. Adam will record his second album as leader in January featuring Rodney Green and Jay Anderson among others. With a love for traveling, Adam has been a part of several tours that have allowed him to see more of the world he once thought possible. As an artist for P. Mauriat, Larson toured Taiwan this past summer; playing shows, hosting master classes and providing input on product testing. His involvement with the Nils Weinhold Quintet has taken him to Germany several times and as a member of various other groups, Adam has performed at major jazz festivals including North Sea, Monterey, Iowa City, and Telluride. Beyond maintaining an active touring and recording schedule, Larson continues to be a sought after clinician and master class presenter at several high schools and Universities across the Midwest and beyond. Adam also does a sizeable amount of commissioned ensemble writing for school jazz ensembles, having written 15 original works to date. Larson is currently a faculty member for Arturo O’Farrill’s Afro Latin Jazz Alliance teaching program and has a strong passion for giving back through the art of teaching. Adam currently studies with John Riley and Rich Perry on full-scholarship at the Manhattan School of Music. In his free time, Adam enjoys writing for Downbeat and Hot House Magazines, and is an avid Chicago Bulls fan.